You already know that cardio workouts and even interval training can be so boring. Plus, they strip away precious minutes you don’t have. You don’t have time to do your workout plus another 20-30 minutes of cardio or even intervals. What if I told you that you can get the same results in just 2 minutes? Would you be interested? Of course you would. I haven’t trained my clients to use cardio or intervals in years, yet they STILL get amazing results using my special workout “grand finales” of workout finishers. But one question I get all the time is… “Mike, what are your shorter finishers like?”. 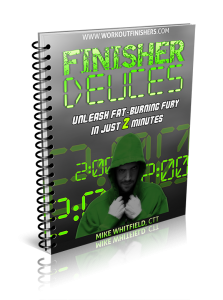 If you don’t like ANY of the finishers inside this hot NEW program, we’ll let you keep all of the finishers PLUS we’ll refund every single penny back to you. If you don’t get the results you’re looking for AND have fun with these, I don’t want your money…. PERIOD. So give these finishers a full test drive for 60 days and if you don’t like them for any reason, I’ll refund your investment with no questions asked. Lose fat in two minutes and have fun doing it! PS – It’s time you kick cardio to the curb and get out of your comfort zone with these 2-minute grand finales you can plug in with any workout. PPS – If you’re not satisfied for any reason within 60 FULL days, I’ll refund every penny back to you and let you keep the finishers. Note: This Metabolic Workout program is downloadable. No physical products will be shipped. After your order, you will get INSTANT ACCESS to download the e-book. The e-book is in PDF format.